Wiganers were out in force today to welcome HRH The Prince of Wales to the town for the very first time. 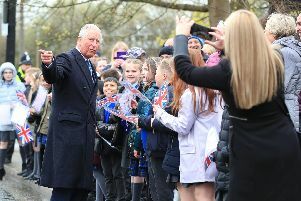 The streets were packed as the bells of Wigan Parish Church rang out ahead of Prince Charles arrival, and the patient onlookers were rewarded with a close glimpse with the future King. He began his engagements by speaking to some of the excited crowd, before taking a tour around The Old Courts. The prince then braved the adverse weather on a short walk around the corner to the Uncle Joe's Mint Balls factory, stopping again to speak to school pupils and more Royalists. His final engagement of the day was at the Wigan Little Theatre, where he was treated to theatrical performances showing off the best of Wigan's culture. Click here for our LIVE blog from the moment he arrived to the moment he left.